A Vancouver-based luxury skincare purveyor utilizes anti-aging ingredients for tangible results. 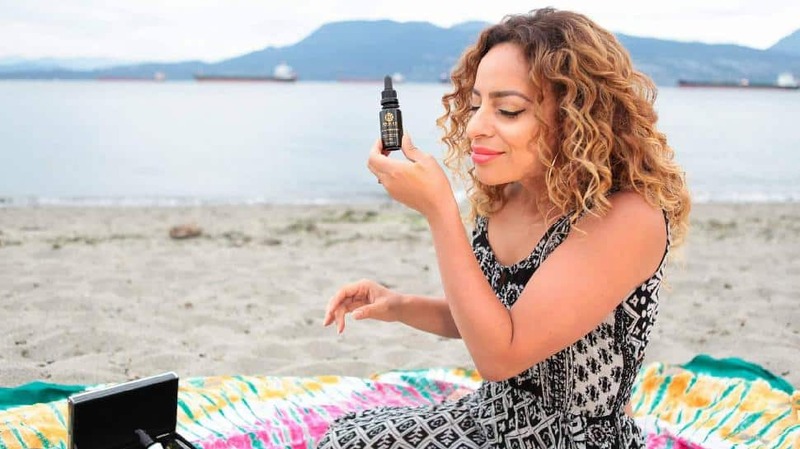 Okoko Cosmétiques luxury organic skincare range focuses on delivering tangible results and the Vancouver-based company understand that consumers strive for anti-aging results and radiant looking skin. With their product offering, the company showcases five rare, organic ingredients in advanced formulas to provide a healthy and radiant complexion that defies the signs of aging. The five ingredients—meticulously researched and tested—promise results including the reduction and appearance of fine lines, brightening and evening of skin tone and additional nourishment and hydration to ensure a dewy finish. This rare and precious red-coloured resin comes from the Croton Lechleri species of plant from the Amazon rainforest. With exceptional anti-inflammatory and skin-healing benefits, it has been used for centuries by Aboriginal people from the area. The powerful compounds and antioxidants make this a very effective in protecting and repairing skin cells as well as assisting in the healthy regeneration of skin tissue. Featured in Okoko Cosmétiques' Dragon's Blood serum, cleanser maskand lip serum, it has also been shown to reduce the appearance of redness and hyperpigmentation caused by acne or sun damage. Consider it nature’s ultimate alternative to traditional retinol. The benefits of retinol use are well noted, but not everyone can include it in their skincare routine due to the potential risks of irritation, dryness or sensitivity during pregnancy. Bakuchiol is a safe, natural alternative that delivers the same benefits as retinol, including decreasing the look of fine lines and wrinkles, promoting healthy collagen production and reducing acne breakouts. This unique botanical seed-based ingredient has been studied vigorously and has been proven to not only work exceptionally on its own, but also boosts the efficacy of traditional retinol products. Featured in the Les 16 Précieux facial oil, which can be used both morning and night as a treatment serum, this powerful ingredient improves the elasticity and quality of collagen in your skin or even boost the effects of a current retinol-based plan. The focus of anti-aging products is a firmer and more toned complexion. Over time, the natural plumpness of skin decreases due to the decrease in collagen production. Okoko has found an ingredient to prevent and slow down this process: white lupin extract, sourced from the white lupin flower. This remarkable botanical extract—found in the Les 16 Précieux facial oil—has been clinically proven to improve the firmness of facial contours around the eyes and supports the synthesis of healthy collagen cells, which remodel and improve overall elasticity. Potent antioxidants are vital parts of an effective anti-aging skincare routine, combating free radical damage. Okoko uses various powerful antioxidants in each product and one of these is tomato oil, which is rich in antioxidants such as lycopene, tocopherols and carotenoids. The specific combination of antioxidants and protectors has been shown to protect against UV sun damage and environmental stressors. It slows down the signs of aging by creating a more unified complexion and keeping the skin balanced and nourished. 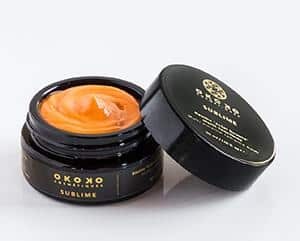 Okoko has infused tomato oil in the beautiful Whipped Sublime Balm which can be used as a rich night balm and overall facial moisturizer throughout the year which softens and illuminates skin instantly. One of the keys to having a radiant and youthful complexion is ensuring the skin is regularly exfoliated. This essential step helps slough off old, dull cells so newer one underneath are revealed. The result? Healthy, illuminated skin. 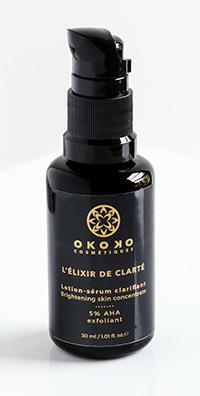 In Okoko’s in-demand L’Élixir de Clarté serum, fruit- and natural sugar-based AHA efficiently removes dead skin cells and brightens skin. This form of exfoliation goes slightly deeper than more traditional methods such as scrubs, and can even help diminish dark spots and uneven skin tone over time. With regular AHA serum use as a vital part of your nighttime routine, the skin is renewed and refreshed, revealing a radiant glow that is indicative of truly healthy skin.